Hatfall pokes fun at a certain war-themed-hat-simulator by having players collect hats in increasingly obscure and confusing ways. Ben "Yahtzee" Croshaw has been a long-standing staple of The Escapist, and his quick-witted lightning-fast Zero Punctuation reviews are how a great number of you started coming here in the first place. 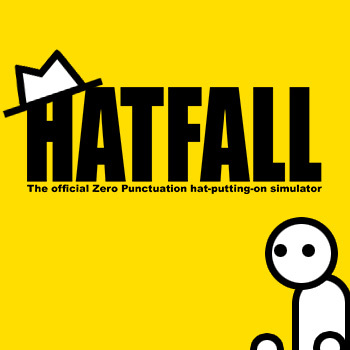 But the best kinds of satire mimic the medium they mock, which is why we are proud to announce Zero Punctuation: Hatfall: a Zero Punctuation-themed browser and mobile game designed by Yahtzee himself. In Hatfall, hats fall from the sky, and you move Yahtzee back and forth to catch them. If you miss, and the hat hits the ground, you lose. However, the game is constantly throwing curve-balls at you to keep you on your toes, such as "fakeout" drops that will kill you, "alter ego" doppelgangers that confuse you by moving around randomly, and even an angry wizard who will curse you if you snag his wizard hat. But players will quickly discover that a career in hat procurement is more fraught with pitfalls than it seems at first glance. Activating Survival Mode, for example, will add the need to look after Yahtzee's hunger and thirst meters, and could even necessitate a trip to the forest to hunt for food. Can he fill the larder without raising the ire of the local forest animal corporation? Will he hunt down a rare forest buffalo, only to realize that he can carry a meager 100 pounds (45kg) of meat? Of course, that's just one of the hidden mini-games that may ensnare our hero in his ongoing quest for hats. Can he survive attaching wheels to his trusty desk and riding it down a hill? Or make it all the way through an insurance claim form without first rendering himself entirely insensible on cheap whiskey? We won't even talk about the trials that await in the mini-game known only as 'Dating Sim'. "I've wondered for a long time if you could make a game based on Zero Punctuation," pondered Yahtzee when asked for comment. "It only recently occurred that the best approach to capture the spirit of the series would be to keep it minimalist and fast-paced, and throw in as much non-sequitur humor as would fit." He concluded with the profound sentiment that "I also realized that I didn't trust anyone else to make it." When asked for comment, Hatfall Producer Simon Deal said, "IÂ¹m excited to collaborate with Yahtzee to help bring his vision of a Zero Punctuation-inspired game to fans worldwide," continuing, "IÂ¹m sure that fans will delight in the humor that only he can deliver." Filled to the brim with ZP references, Hatfall really is a game tailor-made for Yahtzee's most die-hard fans. Stay tuned for more info on Hatfall, like the answers to the most frequently asked questions; "What kinds of hats will you be able to collect?" and "If I don't play Hatfall, will I still be worthy enough to watch Zero Punctuation?"